As far as body-consciousness goes, the body-con style (aptly named- pun totally intended lol) definitely pushes some boundaries for me. I always agonize over a dress that is super tight over my belly and waist, but then I look at the pictures- (and listen to the compliments I get!!) and then wonder why I bother worrying! 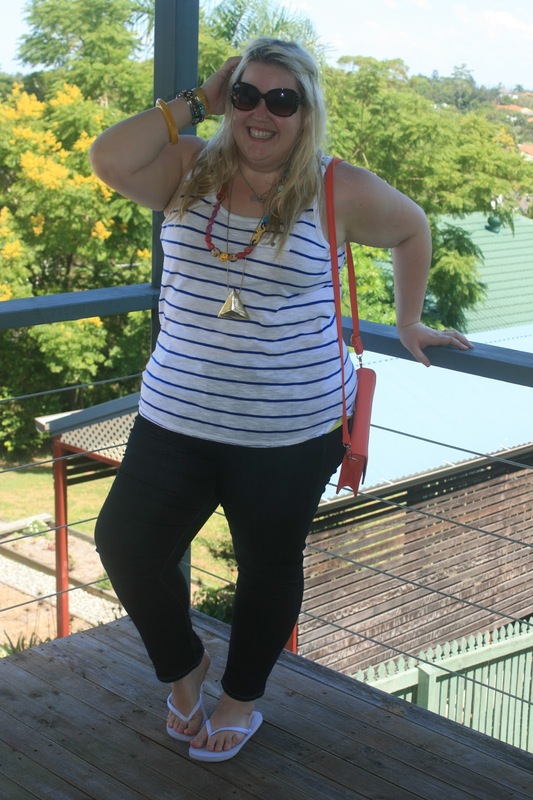 I actually think that body-con style really suits a plus-size body. I know for me, they draw attention to my hour glass shape- something that often ends up getting hidden under clothes! So even though it pushes me on to the edge of my confidence, I definitely feel like it does my shape favours! And ultimately, living on the edge of your own self-imposed style boundaries is what makes fashion so much fun, right? So where do I start with this dress. Well, apart from being an absolute show stopper, its also amazingly comfy and makes me feel fabulous. The sleeves are made with the perfect amount of stretch so you don't have that awful 'stuck in the arm hole' feeling, while the second layer of lace gives me a bit more confidence (and less tramp-feeling) in such a body hugging outfit. Without a doubt, Torrid have delivered on the perfect plus-size dress again! And even better, this dress is now on sale! Winning!! I'm obsessed with body-chains at the moment. Real Diva's Are Large have a really awesome range of fabulous body chains and necklaces and all built with our more-generous body shape in mind. This particular one is my current favourite- I'm building up quite the collection! I wish it came in straight silver rather than the two tone, but again, it adds the extra element to the outfit and looks great with the black. The wedges are from Betts- my go to Aussie shoe shop for bargain finds. They always have the best sales and these beauties were picked up for under $20! Score!!! What do you think about body-con styles??? This weeks Fatshion Faceoff challenge item is coloured stockings- one of my all time favourite outfit punching things to wear! If you haven't heard me raving about We Love Colors yet, you must be living on another planet. I literally cannot recommend them enough- they are without a doubt the comfiest stockings I've ever worn. Available in over fifty colours and with a size chart that caters to up to 170ks/6foot, they pretty much have everyone covered. And amongst my seemingly ever-growing collection of We Love Color's tights, is this spanking hot purple pair! As you can see, I've finally had some shape cut into my hair. I've literally been growing it our for five years (from a short spiky red hair-do!) and have been waiting for the length before I cut into it. I even toyed with the idea of going back to brunette, but at the moment I'm totally loving the bangs! What do you think?? The dress is an old favourite from New Look Inspire that I picked up on our Holiday of Awesome. 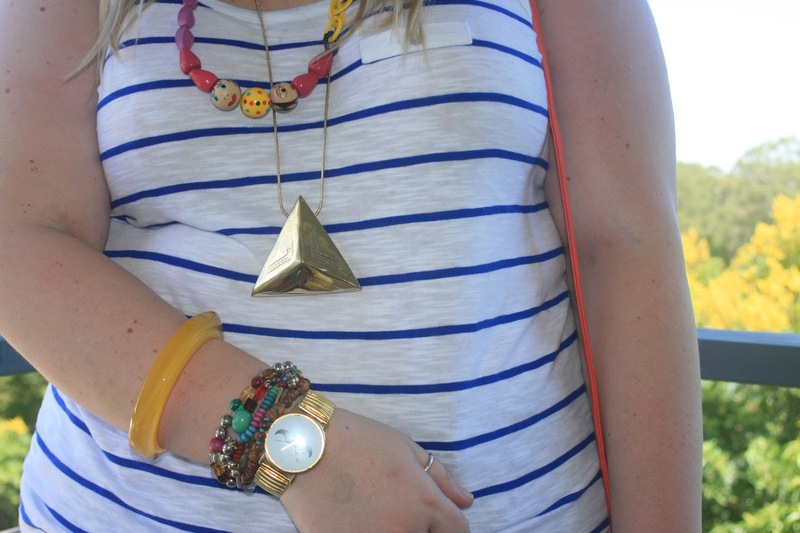 There is something about stripes. They are always such an eye-catching outfit maker. Couple that with the super bright tights and I'm basically walking around screaming to be looked at! I feel like the structure of the blazer balances out the attention seeking boldness of the rest of the outfit, its the perfect professional finish to an otherwise loud look (plus, I suppose me being loud in general probably doesn't help ;). 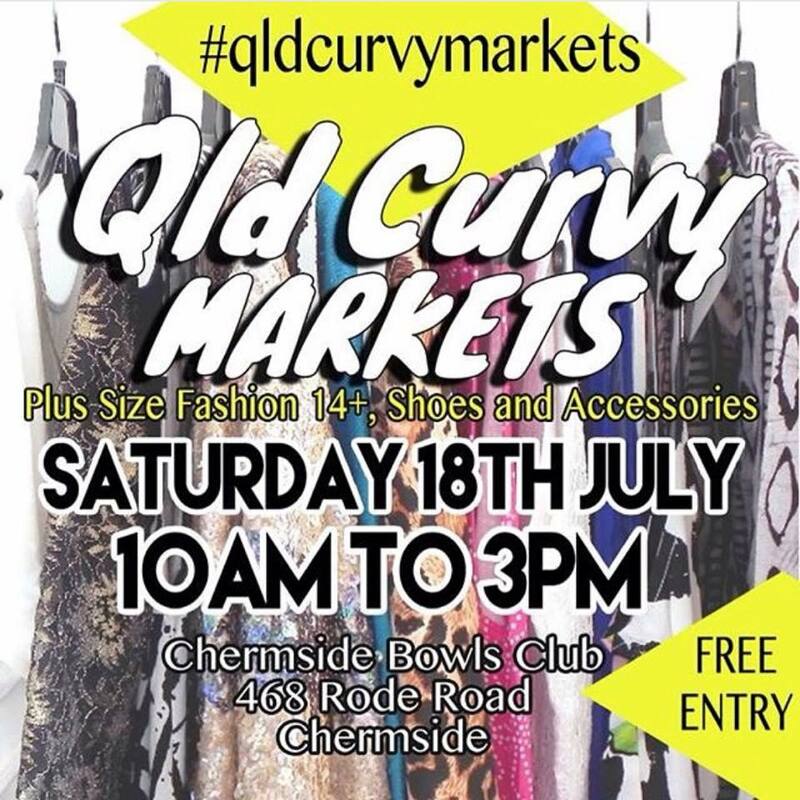 Can't wait to see all my brightly coloured stocking-ed Fatshion Faceoff babes this week! Sometimes, I don't feel like getting dressed up. Sometimes I don't even feel like wearing make-up. This Sunday, was one of those mornings. When I definitely have to go out and my head feels fluzzy and my hair needs a wash, I pull on an outfit like this. 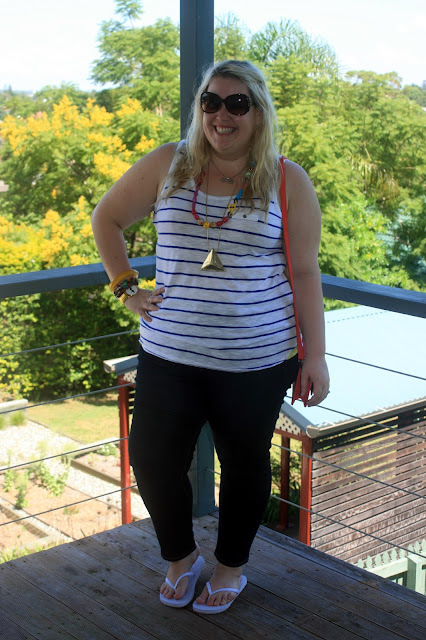 Trusty jeans, a relaxed top and colourful accessories. That surely knocks a wine or two off of my day-after swagger right? 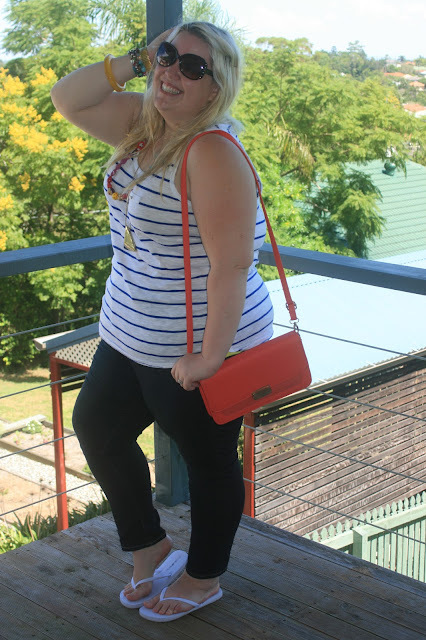 So for this Aussie Curves post I'm showing how I use yellow without overdoing yellow. With a splash at the wrist and some beads on my necklace, I'm injecting some of that smiley yellow punch without being in your face. Also, yellow gold is not something I wear much, so I thought I'd double it up with the necklace and my rad moustache watch! 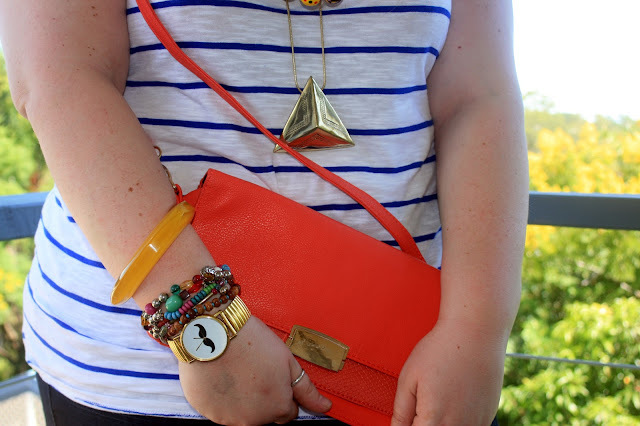 The bright orange bag was a bargain buy from Target for $7. Its wicked colour always makes me happy when I wear it. And of course to comeplete this chilled Sunday morning outfit, I chuck on some thongs. 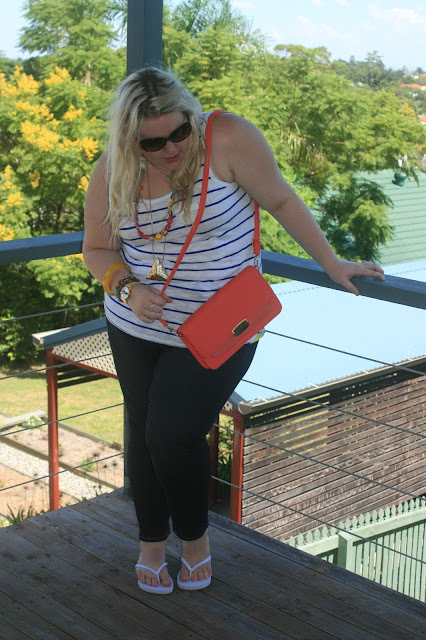 These $4 beauties from Kmart come in about twenty different colours, so they are super easy (and comfy!) to slip into an outfit! What do you wear on lazy Sunday mornings???? So I have this totally rad pair of over the knee boots that I picked up at a clothes swap. Finding boots to fit my calves is hard work, but to fit my thighs?! Well, I couldn't wait to show these babies off! 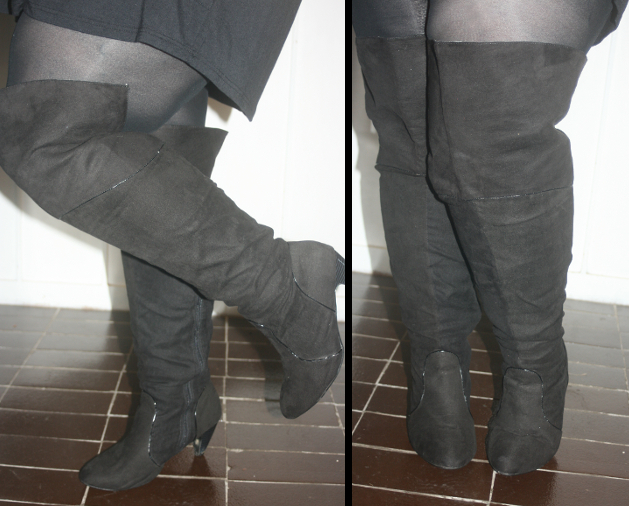 I would actually like them a little tighter to sit more shapely over my legs, but all in all, I'm loving those boots! The heel is the perfect height, just long enough for height but without that 'fear-of-falling-on-my-arse' feeling that I get with anything much over 10cm. It's also quite a decent width which is great for extra support. There is always that risk of looking like a complete ho-bag in thigh high boots, but I reckon this outfit has enough cute and geek to balance it out. 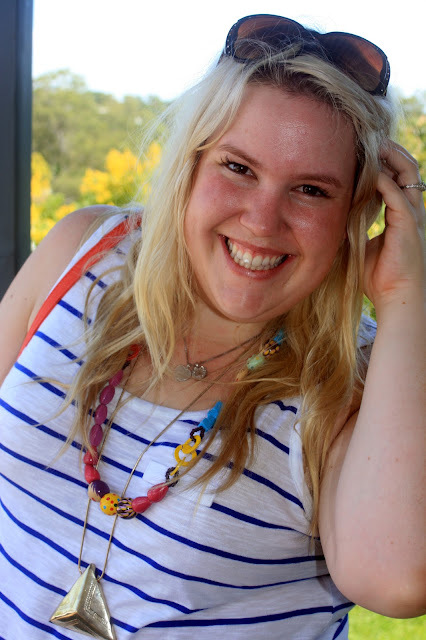 How fab is this Harry Potter snitch inspired necklace?? Totally cool and there is a clock inside the center circle! I wanted this top sooooo bad when I saw it online. I actually don't think its is quite me though and am considering putting it on eBay next week. The cut seems to be too loose or to thick over my bust. And then the peplum seems to sit oddly? I'm not to sure about it, what do you think? Make sure you check out all my booted Fatshion Faceoff babes this week! If you happen to be new here (hey! Hi! Hiya!! ), I should probably start this post by telling you that next year I am lucky enough to be marrying the man of my dreams (check out our engagement photos here!). As I very quickly found out, weddings are actually ridiculously expensive and people weren't just overreacting. With this in mind, we are DIY-ing as much as we can to pinch the pennies! I want to have some gorgeous silver wear on all the tables as decoration , so we have been spending a whole lot of time tea set hunting! And low and behold- seek and gems shall be found!! We picked up this gorgeous set last weekend for $20 at the markets! Bargain! Obviously they are in need of a good scrub and a bit of love, but I think polishing them up to their former glory (or as much as possible) is a big part of what makes vintage collecting such an adventure! I took some before and after cleaning piccys for my Instagram feed and have had a few people ask me what I used, so I thought it would be easier to just show you! Being plated silver (like the majority you will find in op-shops/markets/thrifting) you need to be really careful with the chemicals you are using. Generic silver cleaner or tarn-off will literally start to rub away the shiny silver finish on your collectables and expose the metal underneath. Not so pretty any more are you tea pot!!! 1. Cover the bottom of your container with alfoil- silver side up. 3. Add your item and pour boiling water over it until its fully submerged (if your item is particularly delicate or old, you can use hot instead of boiling water. 4. 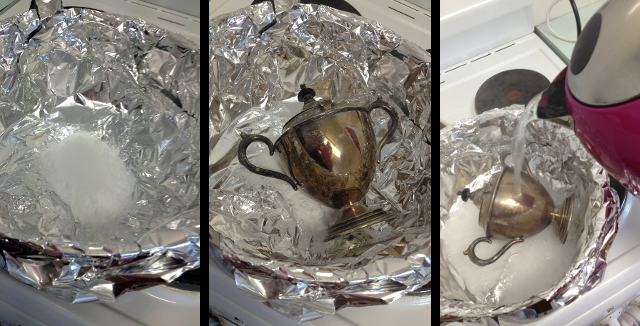 Leave in the bucket for 15-30 minutes and watch the tarnish fade away! 5. 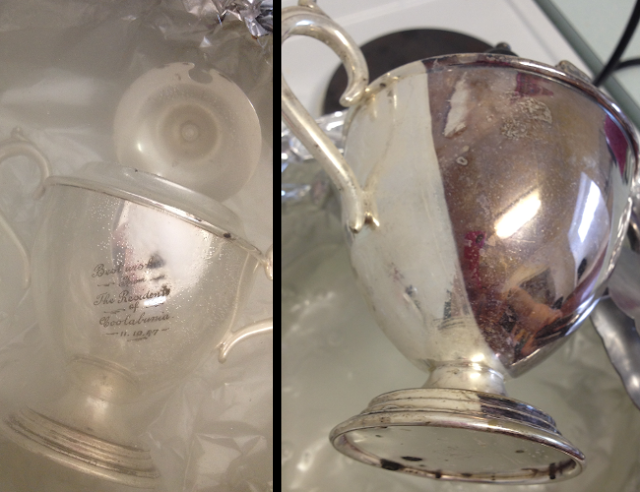 Some especially dark tarnished items may need a double or triple dip. 6. The items will come out with a slight white residue that buffs away to a perfect shine. So that's it! 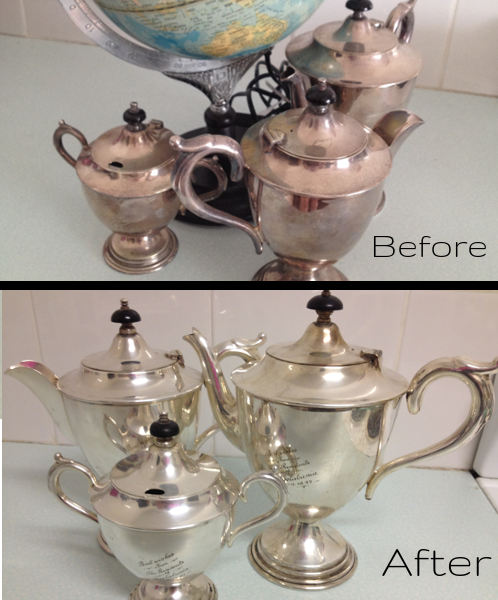 Clean, shinny and restored silver plated goodies! And you may even discover an engraving like we did!! 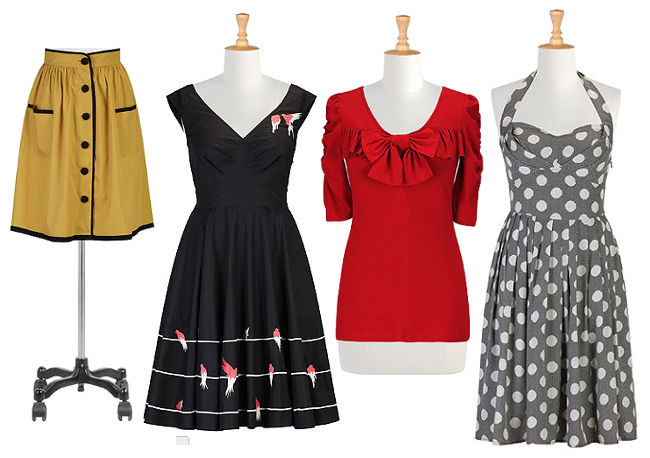 Do you collect any vintage goodies??? Have you ever tried this cleaning technique before? ?